Last night the Capitals beat the Columbus Blue Jackets, 5-0, in Washington, D.C. Last year, that sad result wouldn’t have been a surprise — after all, the CBJ lost 40 games last season and finished at the bottom of the NHL’s Metropolitan Division. Yesterday’s game was different, though, because it brought to an end an amazing 16-game winning streak for the Columbus hockey club. It was the first time the Blue Jackets had lost a game since before Thanksgiving. During the streak the CBJ rose from near the bottom of their division to first place — which is another landmark for the franchise. As of today, the CBJ have 58 points after only 37 games; last year the team had a measly 76 points for the entire 82-game season. For Columbus generally, and Blue Jackets fans specifically, the 16-game streak, and the undefeated December, was pretty cool. It is the second longest winning streak in NHL history, falling one game short of the all-time record, and it saw the Blue Jackets win against good teams and bad, win on the road and at home, and even beat a team that was on its own 12-game winning streak. Sellout crowds started to pack Nationwide Arena, and the people of Columbus started talking about the Blue Jackets around town — a lot. For a franchise that has consistently known failure and disappointment, and that has never won a playoff series, it was heady times. And the Columbus community appreciated it, because it allowed people to think about something other than Ohio State football for a while. So now the streak is over, and it will be up to the Blue Jackets to bounce back, reveal their inner grit and determination, and show that they belong among the best teams in the NHL by playing consistently good hockey for the rest of the season and well into the playoffs. Their coach, tough-talking John Tortorella, has challenged them to do exactly that in the wake of the loss to Washington. After all, that’s what good teams do. The Columbus Blue Jackets — a good team. Who’da thunk it? It’s a great thing. I’ve gotten into an odd new habit this year: I check the ESPN website the morning after a Columbus Blue Jackets to see how the team fared. I did it this morning and learned that they won . . . again. What’s interesting about all of this to me is what it might mean to Columbus. Our fair city has two professional sports franchises — the Blue Jackets and the Columbus Crew soccer team. The Crew has a very devoted following, but even though they’ve been extremely successful they’ve never really captured the city’s imagination. The Blue Jackets, on the other hand, have never been successful. Usually they get off to a terrible start and are effectively out of the running a month or two into the season — which isn’t exactly a recipe for developing legions of new hockey fans. As a result, by December sports fans in Columbus are talking about Ohio State’s upcoming bowl game, the prospects for the basketball Buckeyes, and not much else. I think there’s plenty of room for more dedicated sports fandom in Columbus, outside of our passion for Ohio State — provided the fans have something to root for. I’m hoping the Blue Jackets continue to play well so they can test my hypothesis. This year, I’m detecting a bit of a buzz about the team, even apart from the hockeyheads. And of course it would be great for the city if the CBJ made a run in the NHL playoffs and brought some excitement, visitors, and hotel and restaurant and bar patrons to the Arena District. So, let’s go, Jackets! (Clap . . . clap . . . clapclapclap.) Who knows? I might actually go to a game this year and have a pal explain icing to me for the 45th time. 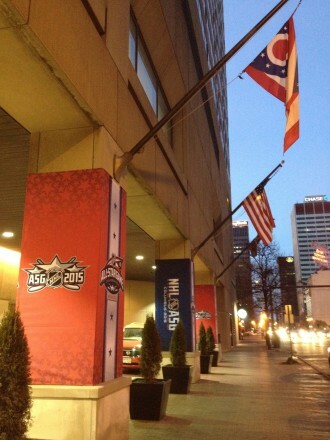 This weekend Columbus will host the NHL All-Star Game. Already you see signs around town welcoming the players, coaches, fans, and other folks who are coming to town for the Game and the festivities — like these signs found at one of the hotels on Capitol Square in downtown Columbus. Unfortunately, Columbus’s home team, the Blue Jackets, have been struggling this year. Their fans will tell you it’s because they’ve been wracked with injuries. 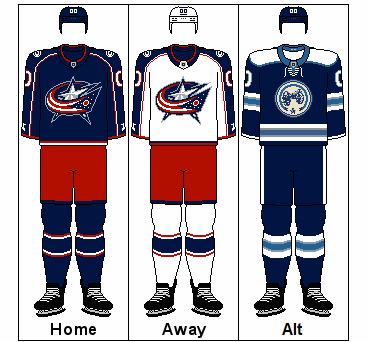 After the CBJ closed with a rush last year, made the playoffs, and won a few games before falling to the Pittsburgh Penguins, the hockey diehards hoped that the Jackets would get off to a fast start and the All-Star Game then would help to cement enthusiasm for the Winter Game in Ohio’s capital city. Things haven’t quite worked out that way. Still, it’s a great thing to have people from all over gather in Columbus for a weekend, and the Arena District, where the All-Star Game will be played, is an area that shows off Columbus very well. I would say that I hope that the weather cooperates — but I’m not sure what kind of weather hockey aficionados want, anyway. Maybe a winter snowstorm and frigid temperatures that would be unwelcome to most of us would just make the rinksters feel like dropping the puck and crashing the boards. One other thing about hockey players: unlike NFL stars, basketball players, and for that matter participants in the annual Arnold Sports Classic, hockey players are normal-sized. When you run into them around town they also seem to be friendly, polite, hard-working guys. They’ll fit right in in Columbus, a generally friendly, polite, hard-working town. Could the National Football League be any more overhyped than it now is? It’s got it’s own year-round network. It’s fodder for talk radio chatter every day, regardless of season. Even the NFL combine, when prospects just run drills for a collective group of scouts, gets breathless coverage and instant analysis. But the annual NFL draft always seems to reach new heights of overhype. After all, it’s just the mechanism by which NFL teams select new players. It doesn’t involve anyone playing a game, throwing a pass, or making a hit. Once it was done in a day, in a private room in New York City, without any TV coverage. Now it’s a glittering event, stretched out over three days, conducted live on America’s principal sports network in front of reporters and fans, with newly drafted players trotted out in front of the cameras and prominent players waiting to hear their fate made the subject of endless speculation. Sports commentators talk about the draft and what teams might do for weeks beforehand, experts perform pointless “mock drafts” and those fake drafts get discussed ad nauseum, and the experts and commentators then criticize the selections the teams do make — all before any player even plays a down. It’s absurd. If you’re the NBA or the NHL, you’ve got to be shaking your heads. You’re in the midst of your playoffs — the most important event in your season — and you’re knocked to the back pages and end of broadcast video clips by the NFL’s mere draft. What could be a better illustration of the NFL’s popularity dominance? I’ve long since grown sick of hearing about the NFL draft and wouldn’t watch it, and I’ve started to hear other sports fans say the same thing. Could it possibly be that the NFL hype machine has gone too far, and people are starting to react to the overload? The Columbus Blue Jackets lost last night, 4-3, and we knocked out of the playoffs by the Pittsburgh Penguins. It’s not an unexpected result — the Penguins were the higher seed and swept the CBJ during the regular season — but it’s an unfortunate one, because there was all kinds of happy buzz in Columbus about the Blue Jackets during the last few weeks. The happy buzz grew as the Blue Jackets won their first playoff game ever, then won a second game on a last-second thriller. Even during the losses the Blue Jackets fought hard and scrapped and made the going tough for the talented Penguins. In last night’s game the CBJ trailed, 4-0, after two periods but they battled back to bring the game to 4-3. They couldn’t quite get the tying goal that would have raised the roof — but the team’s lack of quit is impressive. I’m not a believer is moral victories, but I am hoping that this season and the exciting playoff series galvanize Columbus hockey fans and motivate this very young Blue Jackets team to greater achievements next year. With a few playoff wins under their belt this year, CBJ fans believe the future is bright and are hoping that the team contends for the Stanley Cup next year. It would be a great thing for Columbus. Nevertheless, over the past few weeks I’ve found myself regularly checking the ESPN website for hockey results, and on Wednesday night I actually listened to a hockey broadcast as I drove home from Cincinnati. The Blue Jackets won that game and clinched a playoff spot for only the second time in franchise history. With two games left in the regular season — included tonight’s matchup against Tampa Bay — the CBJ now are hoping to improve their playoff position and avoid a first-round series against either Boston or Pittsburgh, which are the two powerhouse teams in the Eastern Conference of the NHL. Why do I care? I have a lot of friends who are Blue Jackets fans and season ticket holders who have suffered through some dismal, disappointing seasons since the team first started playing in 2000. I’m happy for them. I’m happy for Columbus, too. Nationwide Arena, where the CBJ skate, is the cornerstone of the Columbus Arena District. We need the team to be successful and prosperous for that area to continue to be a growing, vibrant destination. Playoff games will bring excitement, visitors, and tax revenues that will help fill city coffers. And if the Blue Jackets could make a playoff run, all of those positive benefits would be compounded. Of course, the only time the Blue Jackets made the playoffs they were swept and out in three games — but that’s ancient history, right? Let’s go, Jackets!